When the weather is warm, nothing sounds more refreshing than a crisp, healthy salad. This Truffled Avocado, Tomato, and Hearts of Palm Salad is a go-to recipe of mine for everything from dinner parties to picnic lunches. The hearts of palm and truffle salt give it a gourmet twist, but the truth is you can whip up this foolproof recipe in about 10 minutes flat. It’s rather filling, delicious, and a real crowd-pleaser in my experience. Plus, this recipe is Bikini Boot Camp approved, full of fresh veggies and only healthy fats. So if you’re focused on getting in shape for summer without sacrificing taste, you’re in luck! Chop your avocados into small, bite-sized pieces and cut the cherry tomatoes in half. Drain the hearts of palm, and then mix all three main ingredients together in a serving bowl (ours is from Lauren’s fair trade shop The Little Market). 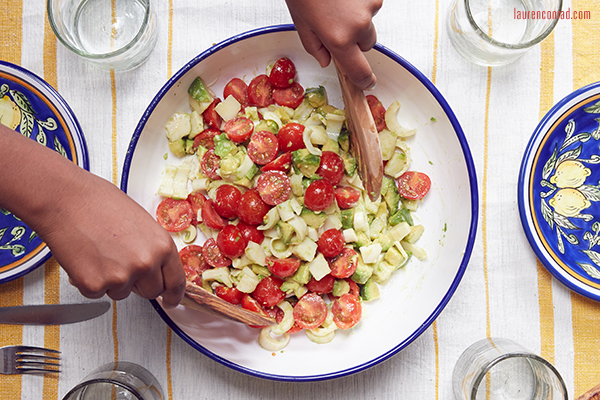 Drizzle with olive oil to lightly coat the salad, and toss gently (without mashing up the avocado). Sprinkle with truffle salt and serve immediately or refrigerate for up to an hour. Note: If you don’t have truffle salt on hand, a sprinkle of regular coarse-ground sea salt is just as delicious (and how I sometimes choose to make it anyway). You can also get the truffled taste by subbing in truffle oil for olive oil.